Hello and welcome to the Tuesday Morning Sketch challenge #439. This week we're revisiting Jenée's favorite sketch #403 which was designed by our own Janice Melton and it's a fun one to work with too! 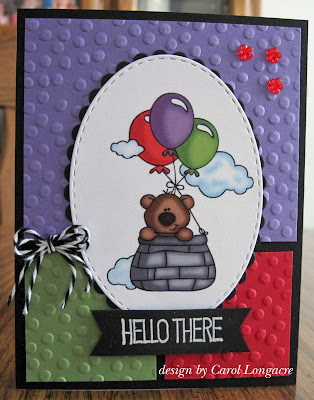 Here's my card where I used some snippets of cardstock that matched the balloons in the image. I embossed each one with a SU! decorative dots embossing folder. The image was given to me pre-colored and with no name attached so I'm sorry I don't know who the artist is. The image panel was die-cut with a Lil Inker stitched oval, and matted with a SB petite oval die cut. The sentiment from an unbranded stamp set was heat-embossed in white on black and popped up on dimensionals. The little double twine bow from the Twinery, and tiny red gemstones from my stash finished this one. Tuesday Morning Sketches is sponsoring the challenge this week and Jenée is offering this great prize to a lucky player so get those entries in! Be sure to visit all the DT members blogs for their creations this week too! 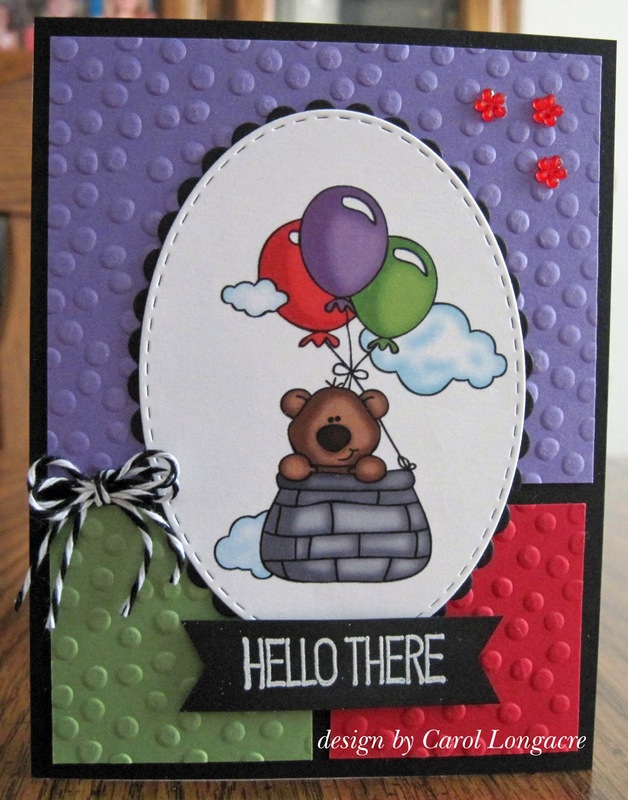 Lovely card, I like the cute image, and the embossed dots give nice texture to the background. Great use of the sketch and of the snippets too. Another great sketch AND another great card! Love the color combination and that embossing. Cute image too. I LUV the colors you've used. The black really makes the other three colors POP, and the embossing makes this card even more fun. Adorable image. This card is great! LOVE this card Carol - and the way you tied the panels to the colours of the image is brilliant! Clever sausage! A super card Carol, a cute image and lovely bright colours. Lovely sketch and more lovely card!! And all made from snippets, wow! :) Love the pieces embossed for the background!! A such cute bear and a beautiful design, well done! Don't recognize this guy but he sure is cute!! Love the colors and embossing folder you used. Really POPS on the black card base. Great colours and embossing and a lovely image,great colouring Carol. Great colors and super cute image! The whole card flows so nicely. What an adorable card! I love the bold colors you used! Congrats on being the monthly gift certificate winner over at The House That Stamps Built! So glad that I am catching up on your blog as I so liked the design of your last card and now I see that this design is a sketch! I LOVE the way the background of this card looks like lego. I am going to try this for my grandson! Love this card Carol. The colors are fantastic and the texture just puts it over the top!